I’d never heard of John Kriesel until I read this story in yesterday’s Star Tribune: In the final analysis, he is one happy warrior. But his spirit and character as portrayed in the article and the Strib endorsement make him seem like the kind of legislator we desperately need right now… and therefore, one I wanted to draw attention to for Veteran’s Day 2010. He was part of the wave of Republicans — in the state and the nation — who reclaimed majorities from Democrats. But for Kriesel, who used to work in a Minneapolis ink factory and joined the Minnesota Army National Guard at age 17, the win wasn’t about party ties. "In the military it didn’t matter what party you’re from or where you lived, what your background was or any of that. Whenever they gave us a mission we worked together to get it done," he said. "And that’s what we need at the Capitol. Ultimately, that’s why I decided to run for office." … "I was a knucklehead growing up," Kriesel said. "I have a little bit of knucklehead still left in me, but it was this incident that opened my eyes. And when I woke up at Walter Reed [Army Medical Center] that was truly the first day of my new life, and for some strange reason I’m happier now than I have ever been in my entire life." The Editorial Board’s conversation with political newcomer John Kriesel, Republican contender for the open House seat in the Cottage Grove area, may have been the most uplifting hour spent with any candidate this year. … Kriesel is something special. A gifted communicator who works as a marketing contractor for the Minnesota National Guard, he exudes commitment to public service and compassion for the vulnerable. He’s resistant to tax increases, but just as resistant to cutting the government services that help people succeed. He sees no reason why the sense of common purpose he helped create in his military unit can’t be generated among legislators to solve state problems. More of his spirit is needed at the Capitol. PUTTING PEOPLE BEFORE POLITICS. It’s not an "R" thing or a "D" thing…it’s a people thing. 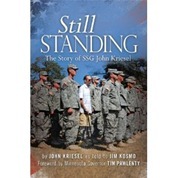 His book: Still Standing: The Story of SSG John Kriesel. Jeesh, he’s appeared 3 times on Wayne Eddy’s show! Thanks for that, Jeff. John Kriesel may be the only representative in the Minnesota Legislature who believes two men should be able to marry each other AND shoot someone who trespasses on their property. It’s one of the things that made him one of this session’s more interesting policymakers. Every year the political parties hand out a playbook to freshmen and warn them to hold to the syllabus. Most do. Kriesel apparently brought his own, and luckily for his constituents, it contains chapters on fiscal responsibility, but also on compassion. It contains entries on common sense and sticking with your convictions, yet also recognizing the necessity of compromise. Thanks for that link, Curt. It’s an inspiring speech.